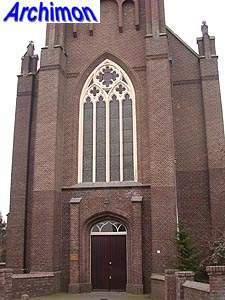 Until 1958 Alem belonged to the province of Noord-Brabant, but already in the 1930’s the creation of a shortcut in the River Maas had left it on the North side of the river, cut off from the rest of the province. 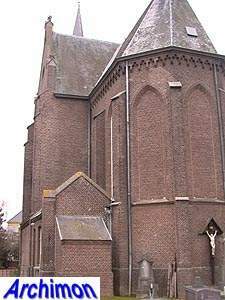 In the Middle Ages the village had a collegiate church which also served the parish. 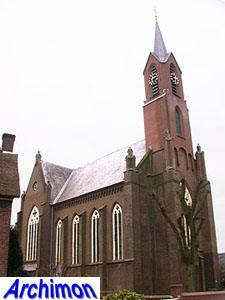 This church, which came in protestant hands in 1648, was destroyed by a flood in 1716 or 1717. 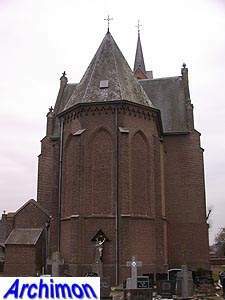 It was replaced by a small protestant church while the catholics used a barn church. 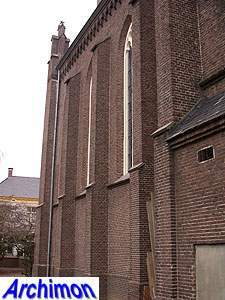 In 1757 permission was given for a new church, which probably still looked very much like a barn. 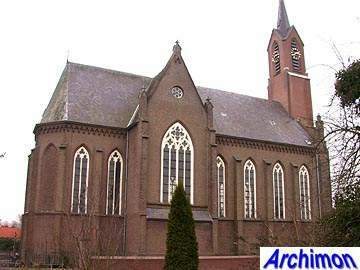 In 1871 a new priest arrived in Alem, who soon decided to replace the old church. 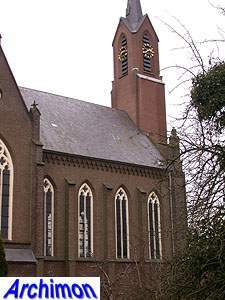 A new church was designed by A. van Veggel. This architect was born in Alem and probably still had some connections in the village. 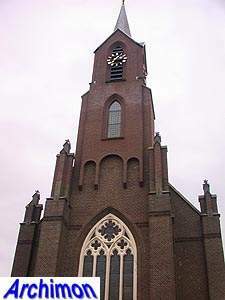 By that time, his career was practically over; his previous church had been built in the late 1850’s and from the 1860’s no works at all are known. Since he died in 1876, the church of Alem was probably his very last. 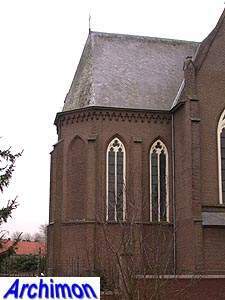 Compared to other churches from this period, the St. Hubertus is in an out-dated early Neo-Gothic style, complete with plaster vaults. 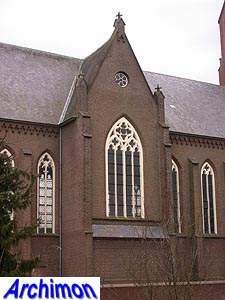 But while its architecture still shows little evidence of knowledge of true Gothic construction, the church is largely devoid of the decorative shapes that were so typical of early Neo-Gothic. 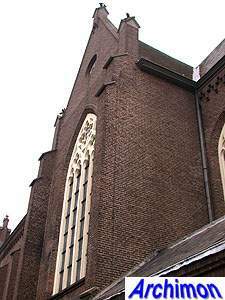 It has a one-aisled nave that ends in a narrow transept which itself is followed by a narrower polygonal choir. 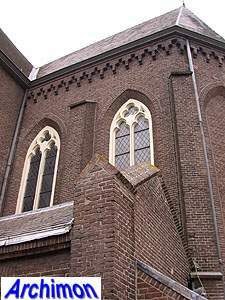 Remarkably, the apse has large pointed niches, no windows. 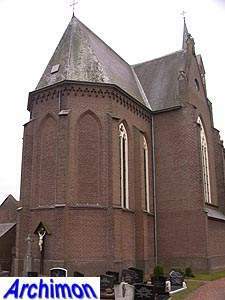 The church survided the Second World War, unlike much of the village and many other churches in the region, although it was badly damaged. A German attempt to blow up the tower was prevented just in time by British troops. However, in 1962 the upper part of the tower was demolished because of a supposed danger that it would come down. 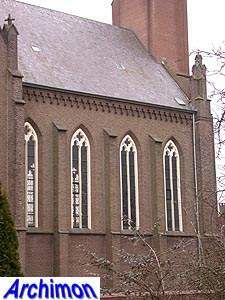 The resulting gap in the facade was filled and an open wooden steeple was put on the roof. In 1997-1998 this wooden tower, which had started to rot, was removed and the original tower was reconstructed.